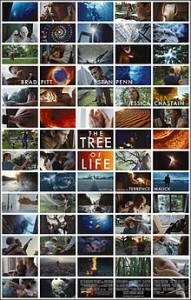 I read a lot about Terrence Malick before seeing TREE OF LIFE. I had never seen any of his films so I wanted to get a rough idea about what I was getting into. I learned that this was only his fifth feature length film in 38 years. I read how he is a very private person in real life and rarely gives interviews. I discovered that this film was decades in the making with a variety of actors attached to be part of the project before Brad Pitt was set to star. With all of the talk from film critics, I expected a truly exceptional piece of filmmaking. TREE OF LIFE may be a special film that is an outstanding piece of art, but it just did not connect with me. The film follows the O’Brien family, a suburban family in the 1950s. Mr. O’Brien, like some men of that time, gave up on his dreams to support his family and raise his sons as strong men. Mrs. O’Brien provides the emotional support to the boys. We watch as Jack O’Brien, the oldest of the three sons, grows into adolescence and explores his more rebellious side. The film also explores the creation of the universe. There is no denying that the film is a work of art. Visually it is perhaps the most beautiful film I have ever seen. The cinematography is incredible. The sequence exploring the creation of the universe and the big bang is truly a sight to behold and well worth seeing the film on the big screen. The acting is very good across the board. Brad Pitt as Mr. O’Brien is intimidating while still being nurturing and a loving father. Jessica Chastain really surprised me, especially since I had never seen her in anything. I can definitely see a bright future from her, and I am excited to see her in the upcoming films THE DEBT, TAKE SHELTER, and THE HELP. My major complaint for the film is that I just didn’t connect with it. For me, it was a very self-reflective experience, and it is just not why I love films. I want to be transported into another world. I want to become emotionally invested in the characters. I want to be entertained for two hours, and this film just did not do that for me. There are plenty of reviews out there that are going to say this film is a masterpiece, and it is the best film of the year. That is the hardest part in reviewing this film. Everyone is going to get something different out of it. I think it is a film that needs to be seen, but I would suggest people to wait and save the money and rent it. At the same time, there is a twenty minute segment that is beautiful to see on the big screen. In the end, this is a film that will not end up on my top ten list, but it may be for you. So check it out for yourself and let me know what you think.